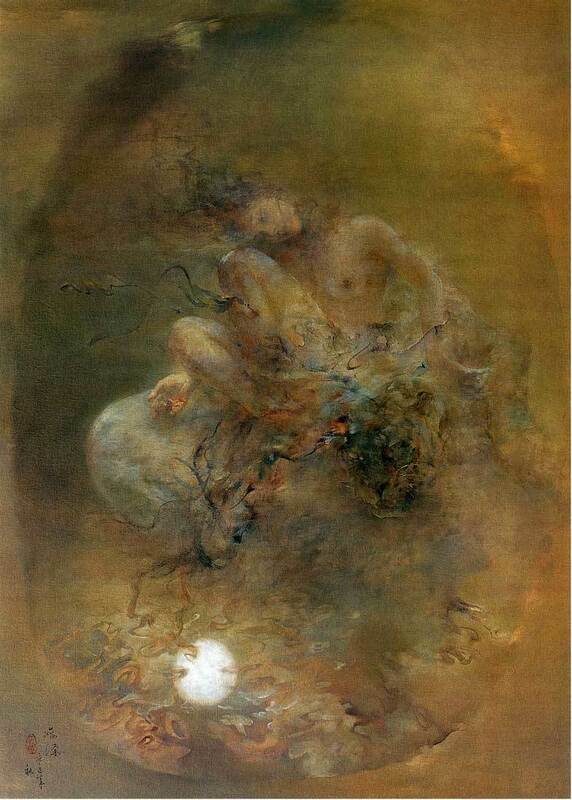 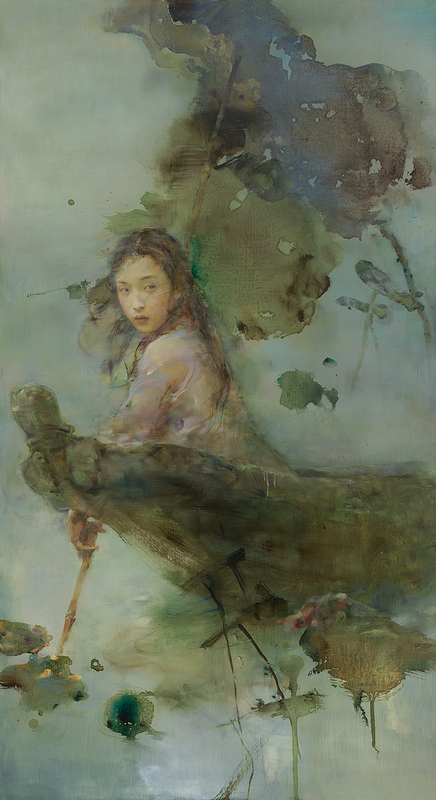 Hu Jundi / 胡峻涤 was born in the Jilin province, in Northern China. 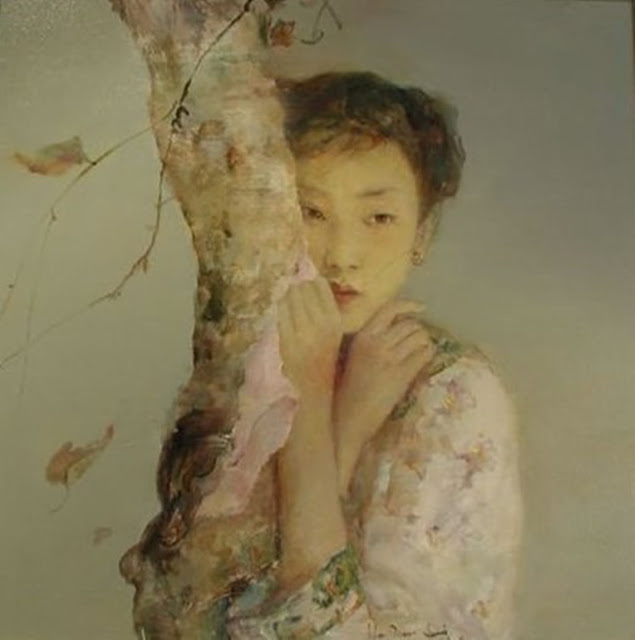 He graduated from Southwest Chongqing University fine arts department in 1984 and presently resides in Sichuan Leshan area. 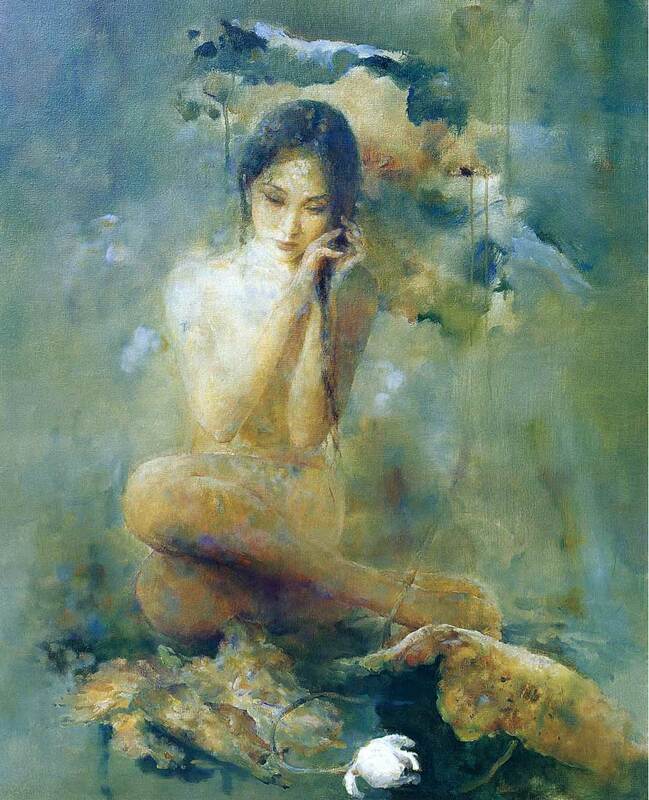 He is recognized for his ability to bring forth a sense of delicate serenity and harmony. He has mastered the fusion of traditional Chinese brush with the unmatched depth of oil painting. 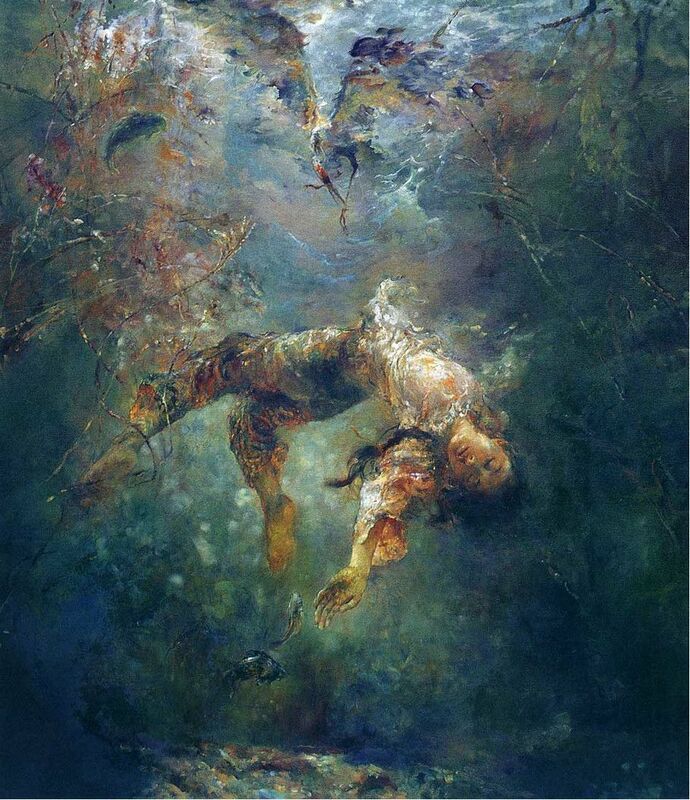 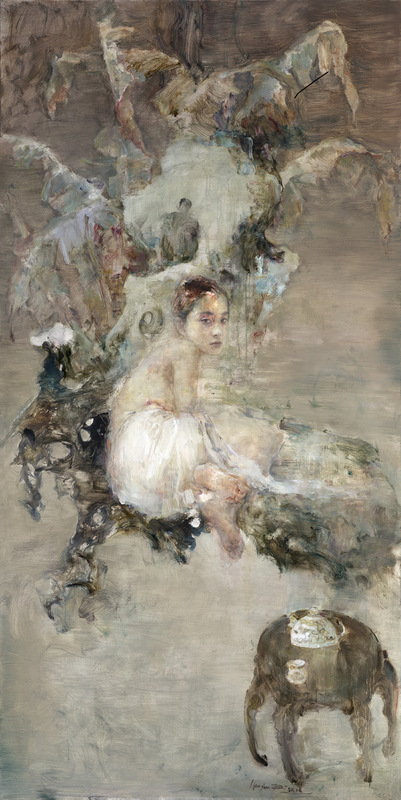 His paintings brilliantly meld eastern and western culture together with complete integrity, the story unfolds as Hu Jundi expresses the poems in his heart through paint on cloth. 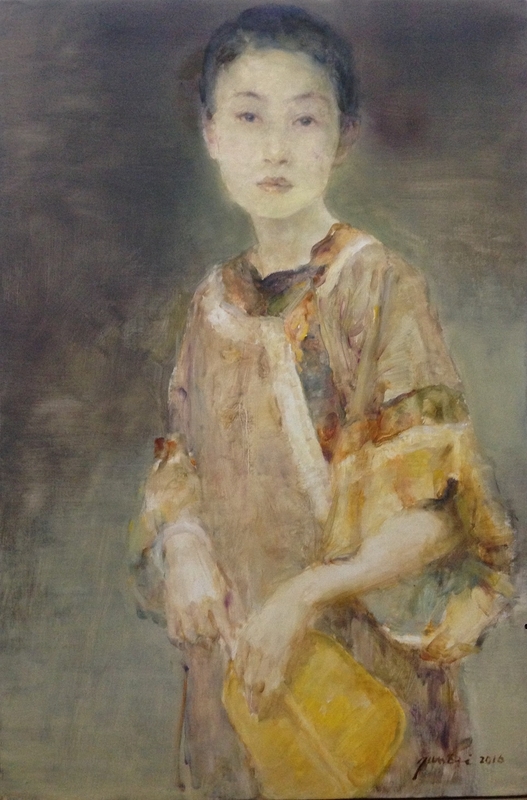 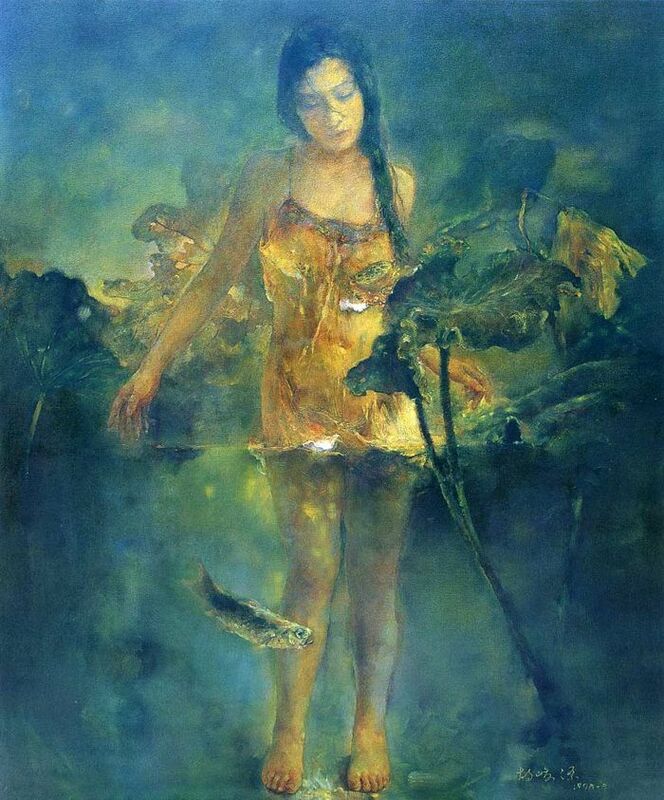 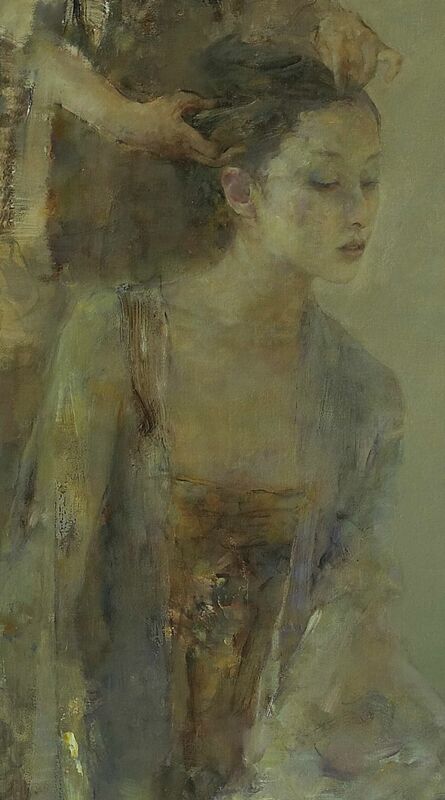 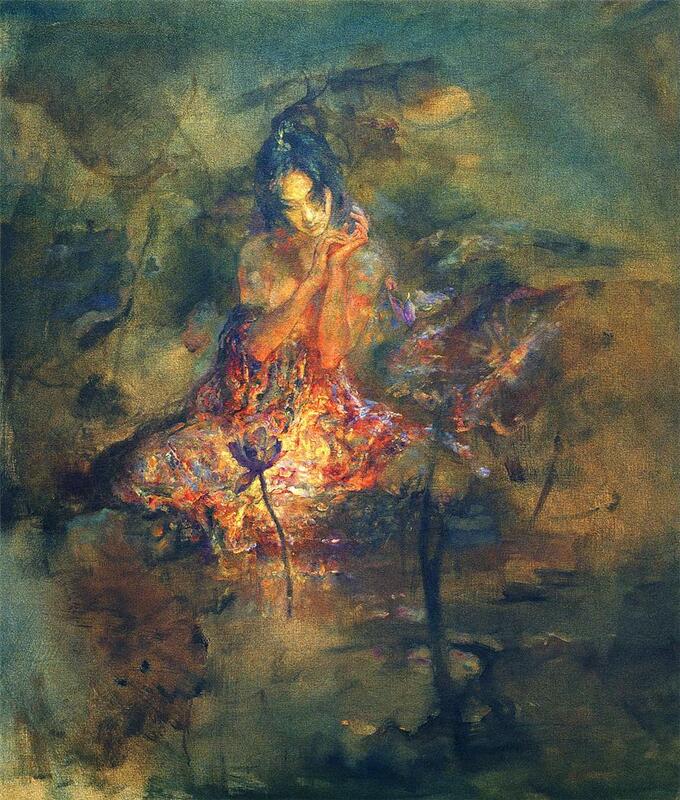 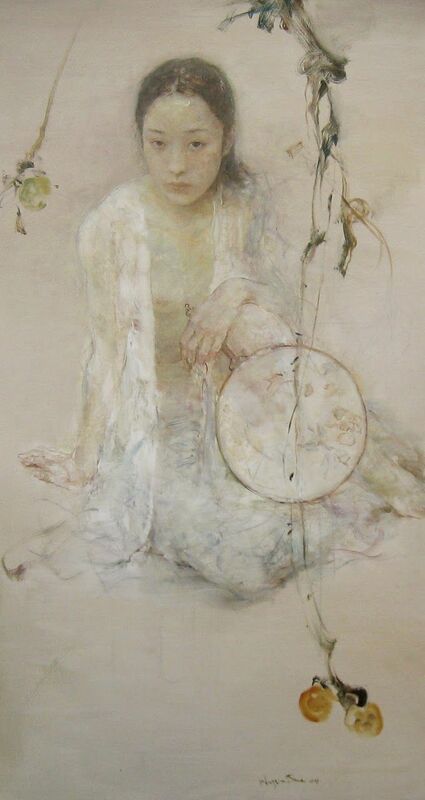 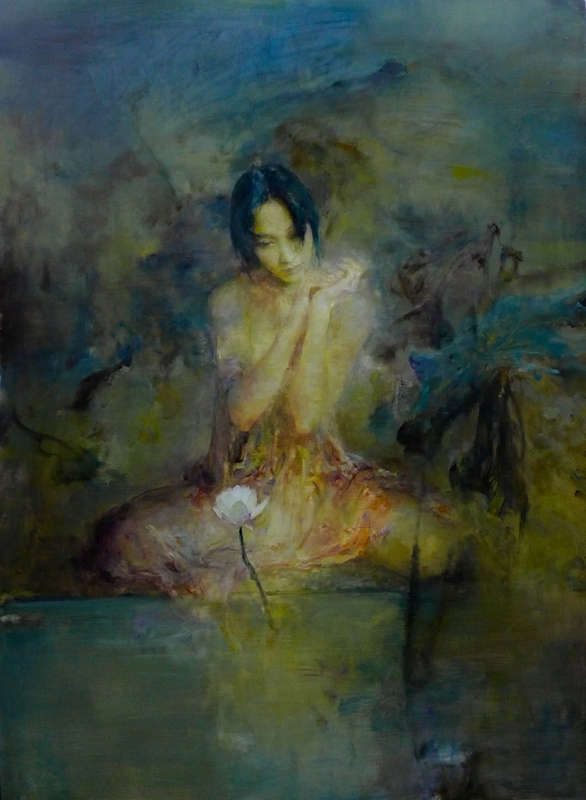 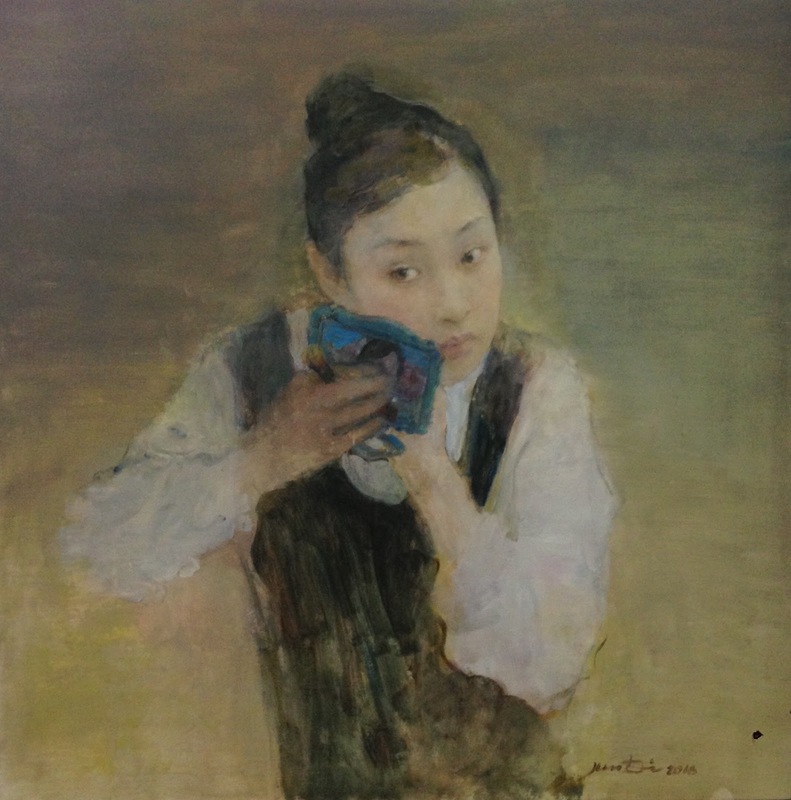 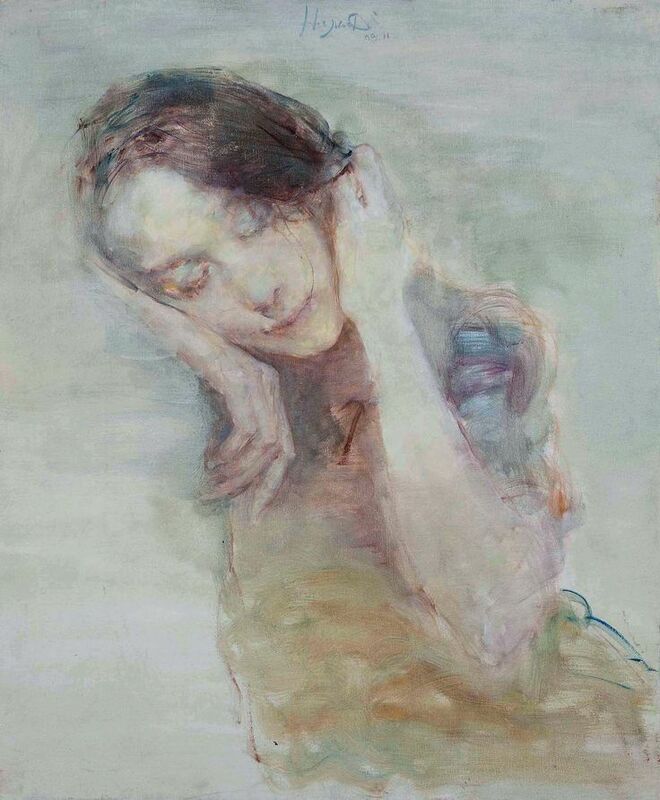 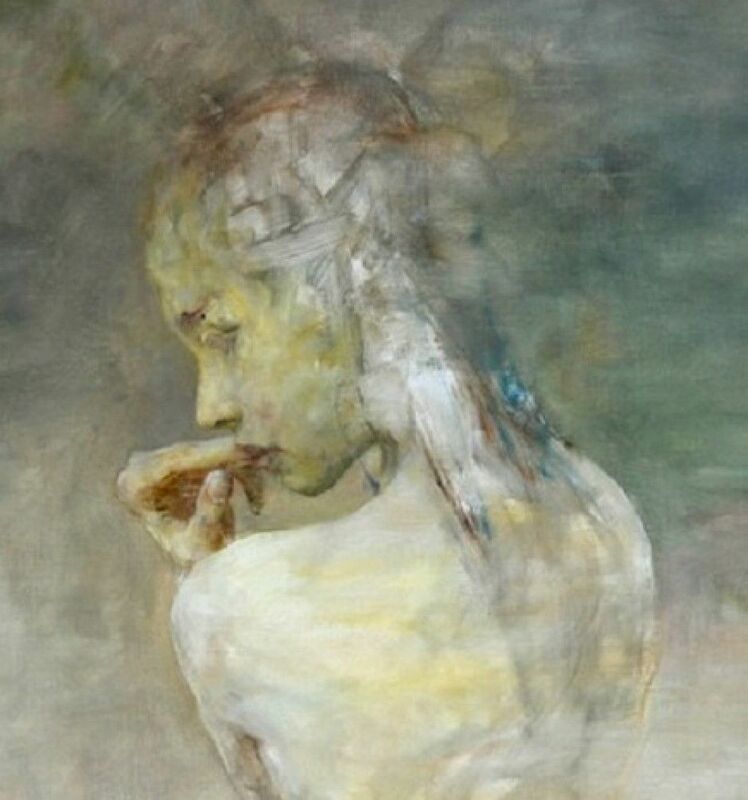 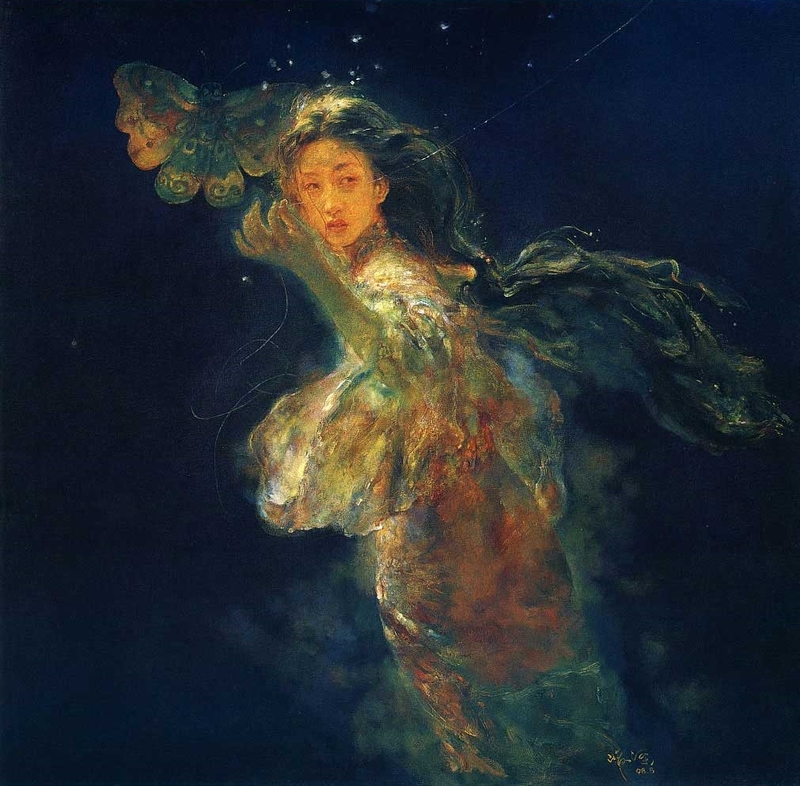 Hu Jundi's works are mostly based on the theme of female characters with classical charm and beauty of the Orient, expressing untainted feminine beauty. 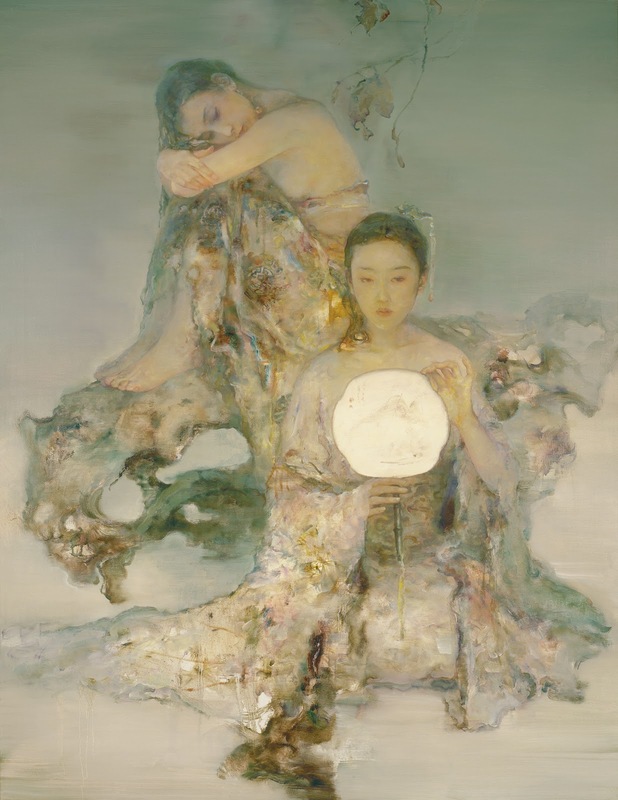 Though one can see the unique vocabularies fusing impressionistic style⏭ and light/shade technique, Hu's artistic expressions are restrained by the reserved nature of his Chinese culture which makes his work magical and seductive. 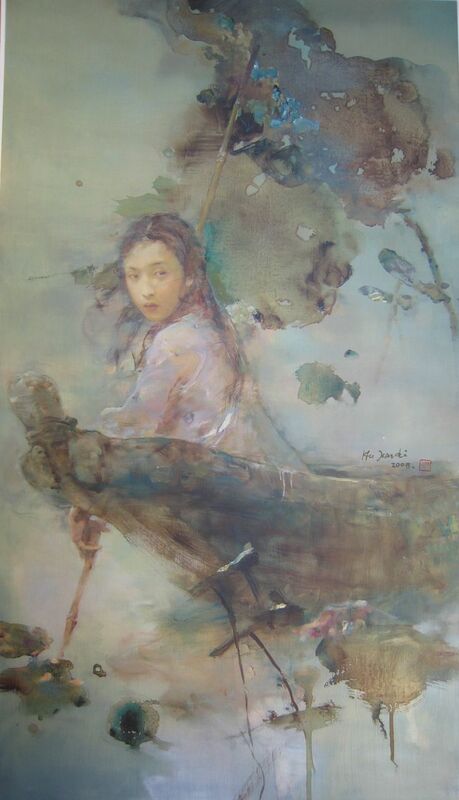 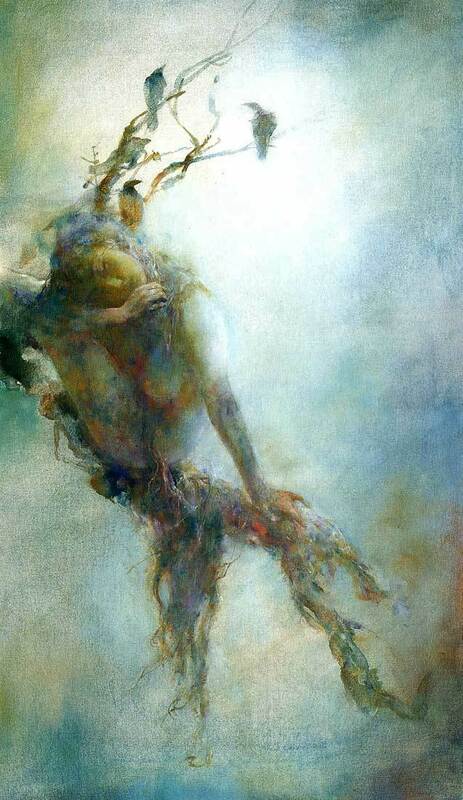 Hu Jundi's oil paintings usually appear to be very thin, created with thin wispy lines while at the same time achieving the same effect similar to the traditional Chinese paintings with corona dyes lending a truly unique style to his creations. 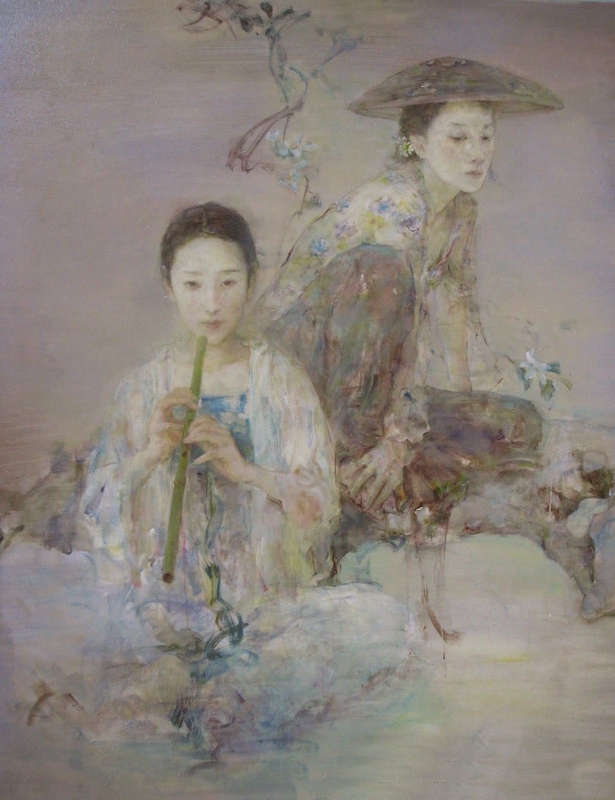 As one look at his work, one sees the impact of the marvelous combination and exchange of the light, shade and color, while feeling the simplicity and elegance of the East and its refined and free style. 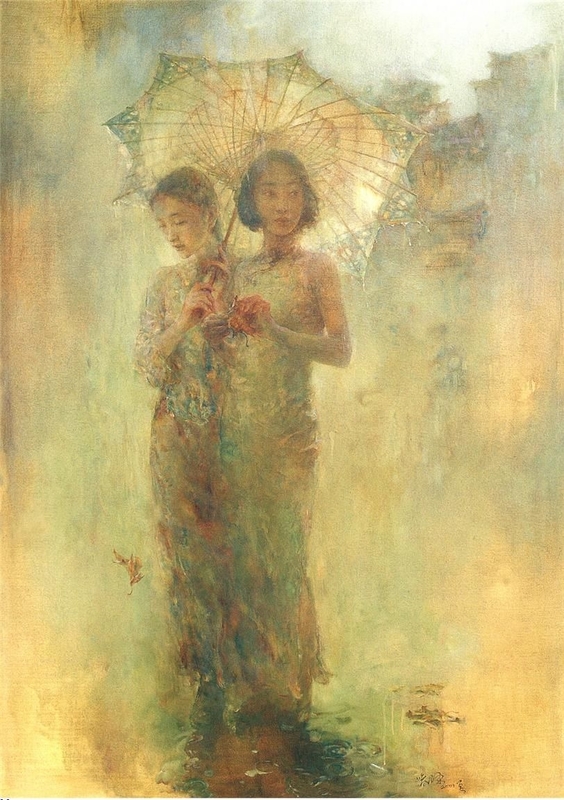 Hu Jundi è nato nella provincia di Jilin in Cina nel 1962. 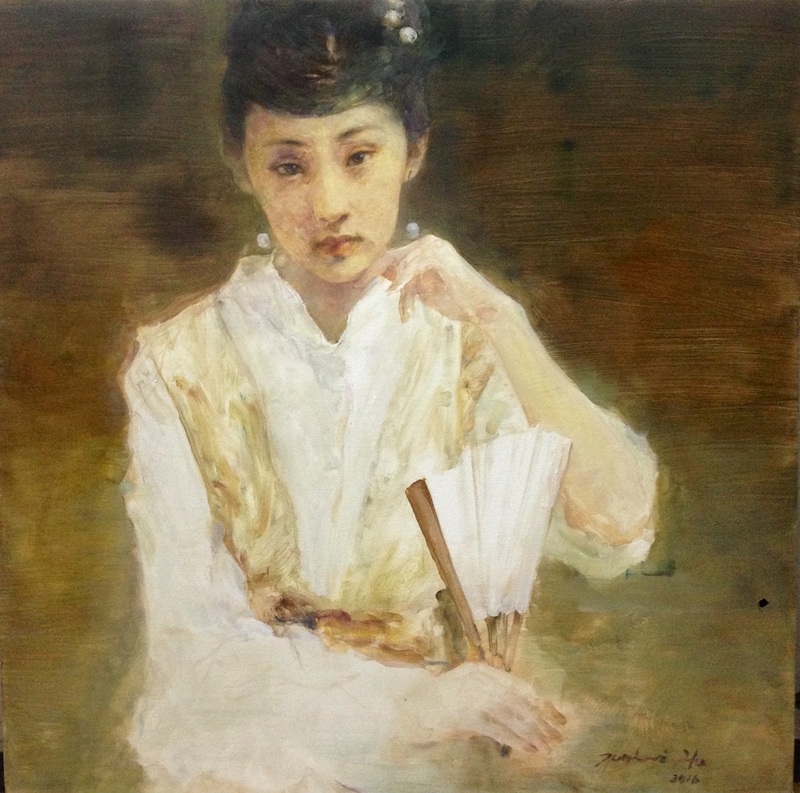 Si è laureato nel dipartimento di belle arti dell'Università di Chongqing nel 1984. 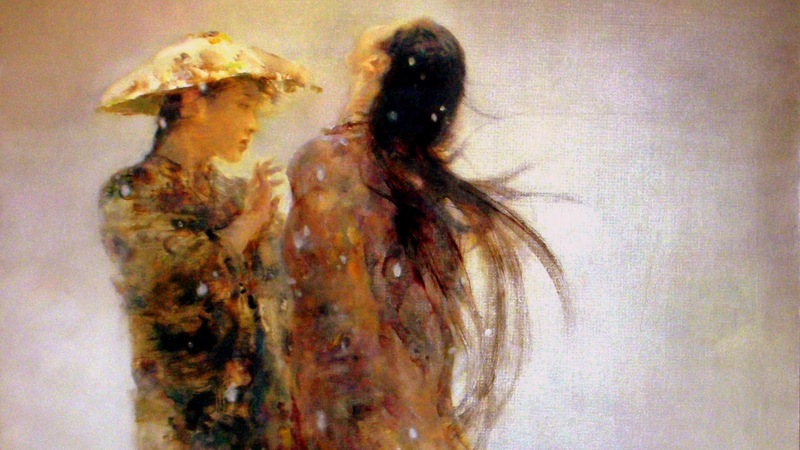 I suoi dipinti fondono la cultura orientale con quella occidentale - dei personaggi femminili con il fascino classico e la bellezza dell'Oriente. 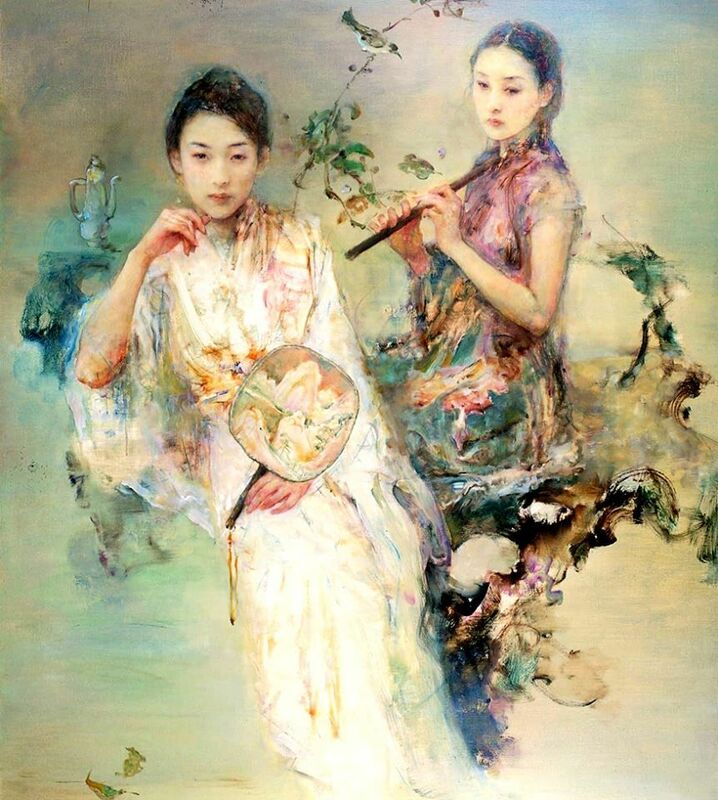 Dipinge donne Sichuan eleganti, serene e belle. 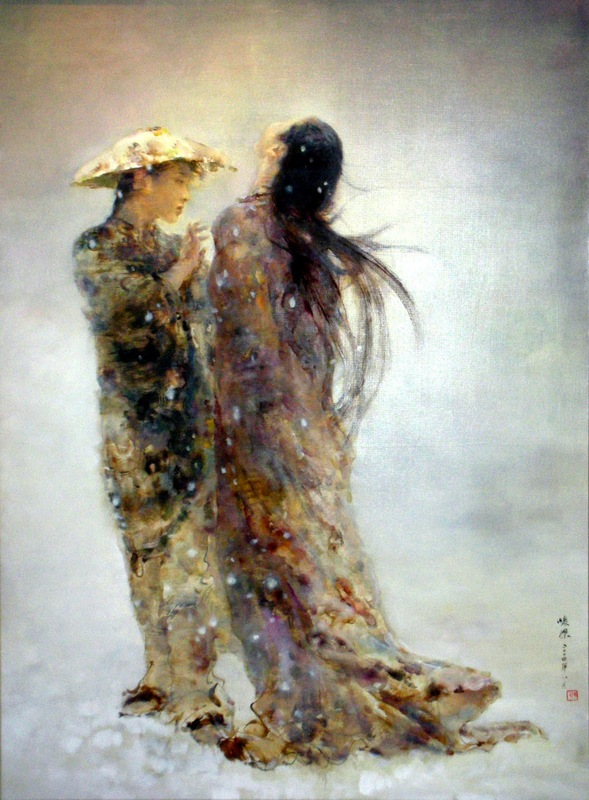 L'abbigliamento è il classico cinese del Sichuan. 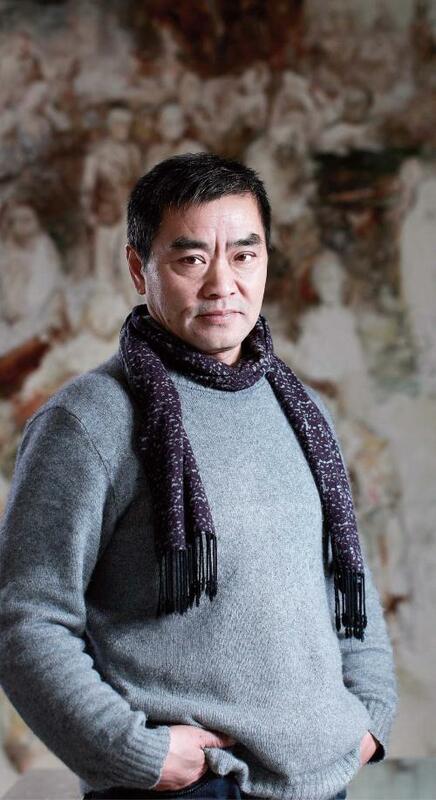 Il lavoro di Hu è stato esposto e raccolto in Cina, in altri paesi asiatici, in Europa ed in America.